Happy Monday y’all! I hope your weekend was rejuvenating or successful or so jam-packed full of crazy going-ons that going back to work is a sort of relief. That is a sign of an awesome weekend! Mine was great. Thanks for asking 🙂 I worked, and ran, and listened to baseball, and mowed, and trimmed, and baked, and ….well I never did get to that laundry. OK, now that we are over the pleasantries…can we talk noodles? Yes, noodles. I like, no scratch that, I LOVE a good noodle. I grew up on chicken and noodles. Beef and noodles. Homemade noodles at church functions, with grandma always bringing home the leftovers in a Cool-Whip container – because once you reach the age of 60, you begin to save every plastic container with a lid and store leftovers in them. It is normal, we recycle, our parents reduce, grandmas reuse…and eat a lot of Cool-Whip. The noodles were/are always egg noodles. Wide or thin, it didn’t matter. But soba noodles, those were never served in Cairo (like the syrup not the Egyptian city). Mainly, because we didn’t eat a lot of Japanese themed dishes. Also, I don’t think small town Ohio was/is known for its Japanese cuisine. 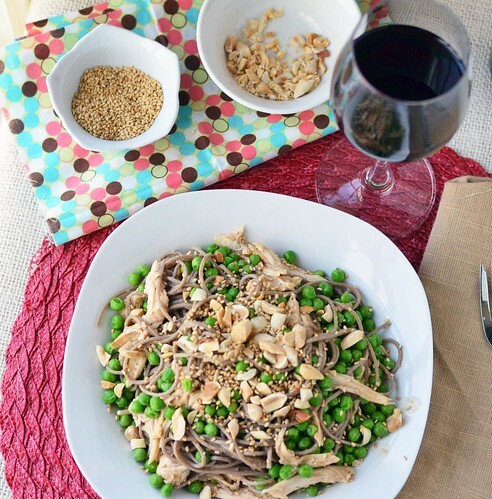 Soba noodles are a buckwheat noodle (for those of you not in the know…). Actually, are you ready for this fun fact? Soba means buckwheat in Japanese. So…we are talking Japanese spaghetti like noodles. With me on this? Good. This recipe came to me from the motivating pages of Runner’s World. I had a package of soba noodles staring at me from the depths of my cupboard and a knob of ginger, just waiting to be grated. This dish was meant to be made in my kitchen. After a long run. The great thing about this dish? It is a cinch to whip up and takes approximately 15 minutes from start to finish. Which is a good thing, because after my looooooonnnngggg run last weekend, the last thing my knees and hamstrings wanted was to be standing in front of the stove. So, before I knew it, I was resting comfortably on the couch, with a plateful of carbs…and my knees and hamstrings, they were as happy as my stomach! Bring a large pot of salted water to a boil. While waiting for water to boil, whisk together sauce. In a small bowl, whisk together soy sauce, sesame oil, nut butter, white wine vinegar, grated ginger, and garlic. Set aside. 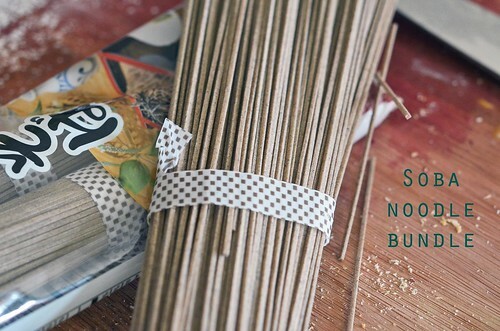 Once water is boiling, add soba noodles and cook according to package directions, which is to boil for about 5 minutes. (they cook faster than regular pasta) During the last minute or two of cooking, add peas. Drain soba noodles and peas and rinse with hot water until the water runs clear. Do not skip this because your noodles will become a clump if left unrinsed. Drain again. 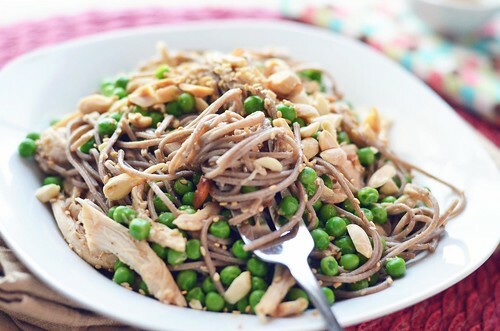 In a serving dish, combine noodles, peas, shredded chicken, and sauce. Toss to combine. 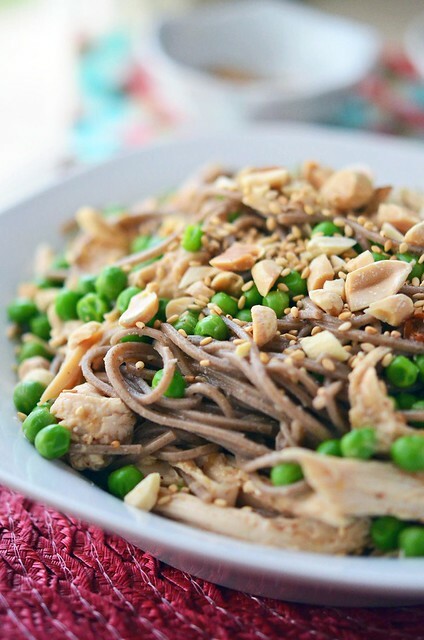 Garnish with chopped peanuts and sesame seeds. This is excellent warm or cold the next day, once the flavors have really had time to settle in.